On 11 February 2009 the Board of Natural England took a unanimous decision to approve the designation of the whole of the Ely Pits and Meadows Site of Special Scientific Interest. This is a fantastic recognition of the national-level importance of this area not just for its spectacular fossils, but for the wildlife it supports as well – in particular its bitterns and other breeding waterbirds. All objections bar one were withdrawn before the hearing, with many of the affected landowners and occupiers expressing their strong support for the new SSSI. This designation need not constrain most existing uses of the area – people will still be able to use it to walk, sail, fish, pick blackberries, cycle, and exercise their dogs. But it does mean that some management operations will require permission from Natural England, which will be refused if these would damage the site’s key features. 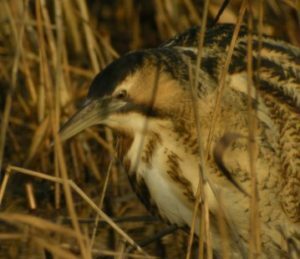 There’s still a long way to go in safeguarding the future of Ely’s Wildspace, but this is an extremely important milestone in the campaign, and great news for the people of Ely and its precious wildlife. Additional information can be found on the Natural England website. To see the BBC coverage, click here. This stunning photograph of a bittern was taken at the beet factory settling ponds, near Queen Adelaide, in January 2009.